Daily Cheapskate: Bella toaster oven for $8.99!! Grab this now for Pesach! WOW! Macy's has this Bella toaster oven specially priced at $18.99, but that net price drops to $8.99 when you submit this online mail-in-rebate for $10.00. It got 4.3 out of 5 stars over 890 customer reviews. Opt for in-store pickup, if possible, to avoid shipping charges (free shipping starts at $75) or buy any low-priced beauty item (like this one) to get FREE shipping. 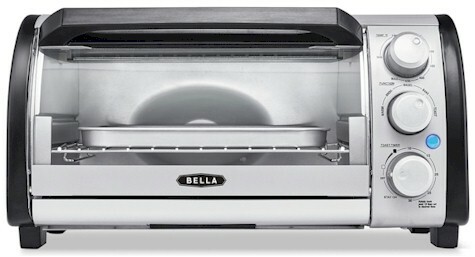 Product details: Roast, bake, broil and more with the Bella 12L Toaster Oven. Its large capacity fits up to 4 slices of bread or a full 9-inch pizza. Choose from 5 settings and adjust the temperature dial to cook frozen foods, bagels, or buns to perfection. It includes an easy-to-clean baking pan and broil rack and features a slide out crumb tray to help contain mess. Interested in more appliances for $8.99 after rebate? Check out some of the small Bella appliances listed here.